Beautiful certificate from the Washington Public Power Supply System issued in 1980. This historic document was printed by the American Banknote Company and has an ornate border around it with a vignette of an eagle, and the company's name. It also shows the names of Nuclear Projects Nos. 4 and 5 on the face. This item has the printed signatures of the Company's officers. This is the first time we have seen an uncancelled bond from this famous default. 53 unused coupons attached on the right side of the bond. In the 1950s, the Legislature authorized formation of joint operating agencies that allowed cities and public utility districts to join together to develop electricity generation projects. In 1957, 17 public utilities formed the Washington Public Power Supply System. The first project was the Packwood Lake Hydroelectric Project. During the 1970s, the joint operating agency began construction of three nuclear facilities, one of which is the Columbia Generating Station at Hanford, the only operating nuclear power plant generating electricity in the state. A joint operating agency is authorized to issue tax exempt revenue bonds to finance its projects. 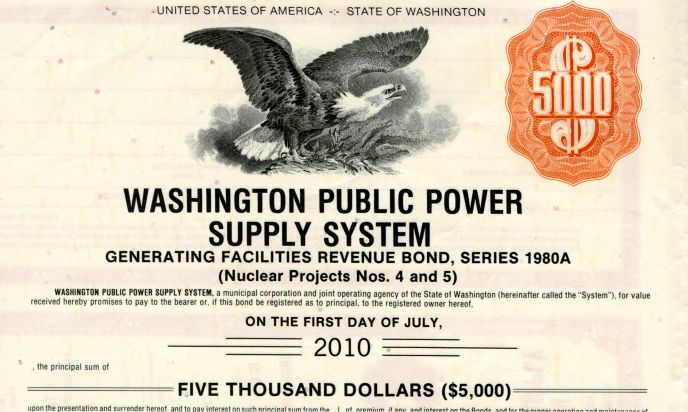 In the case of the first three nuclear power plants, revenue from the Bonneville Power Administration (BPA) was used to guarantee repayment of the revenue bonds through a system of net-billing. An IRS ruling in 1972 changed the tax exempt status of federal agencies and further net-billing agreements were prohibited. For the agency, under the regionally developed Hydro-Thermal Power Program, the 1970s brought the challenge of attempting to simultaneously construct multiple nuclear power plants. Over-commitment to nuclear power brought about the financial collapse of the Washington Public Power Supply System, which undertook to build five large nuclear power plants in the 1970s. By 1983, cost overruns and delays, along with a slowing of electricity demand growth, led to cancellation of two WPPSS plants and a construction halt on two others. Moreover, WPPSS defaulted on $2.25 billion of municipal bonds, which is still the largest municipal bond default in U.S. history. The court case that followed took nearly a decade to resolve. The WPPSS acquired the nickname "Whoops" in the media. In January 1982, the WPPSS board stopped construction on Plants 4 and 5 when total cost for all the plants was projected to exceed $24 billion. Because these plants generated no power and brought in no money, the system was forced to default on $2.25 billion in bonds. This meant that the member utilities, and ultimately the rate payers, were obligated to pay back the borrowed money. In some small towns where unemployment due to the recession was already high, this amounted to more than $12,000 per customer. The bond holders sued and the matter wound it way through courts for the next 13 years. Plants 1 and 3 were never finished either, but their costs were backed by the Bonneville Power Administration and the power it generated from the Columbia River Dams. Plant 2 at Hanford was completed in 1984 and is now called the Columbia Generating Station. It produces 12 percent of the power supplied by the Bonneville Power Administration at a cost of 2.3 cents per kilowatt hour. Seattle customers pay an average of 3.89 cents per kilowatt hour. The unfinished plants were mothballed against the possibility that construction would be resumed. In 1995, WPPSS decided to demolish what remained of the structures.